Optimise your Facebook Profile for Privacy and Publicity! It is surprising, scary even, how so many people have their privacy settings wide open on their Facebook profile, showing off their personal family photos for the world to see. This is particularly noticeable when people post in Facebook Groups. At the same time, while revealing all that should be private, people often do not showcase what should be public. Now that I have you all concerned about your profile, you can quickly see how other people view your profile by selecting the ‘View As’ option that drops down from the ‘three dots’ on your cover picture. You can choose to ‘View As’ a specific person, or ‘View As’ public. As you update your settings you can check back to see that you are getting the results you want! 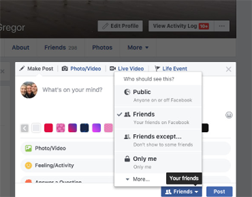 Your Facebook profile can and should be set to showcase your best features to the public, while only revealing your girls’ night out or pet photos to those who care. 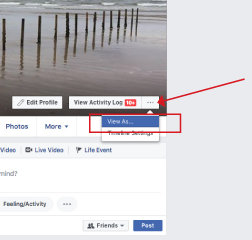 Navigate to the Privacy Settings from the drop down black arrow, top right of your Facebook profile. Edit the ‘Your Activity’ so that only friends can see future posts as the default. When posting, you can choose to override the default that you have set. Select ‘Use Activity Log’ so that you get to review any post that you are tagged in before it appears on your timeline. You’ll notice that the first option only limits future posts. If you want to make all past posts restricted, select ‘Limit Past Posts’. Facebook will put up all sorts of warnings, but go ahead if this is what you want. Click on the ‘Edit Profile’ button on your cover image and this will allow you to edit your public ‘Intro’ profile. You get to add up to 5 ‘portfolio’ photos that will be public, as well as a short bio. Under the ‘About’ tab you can control who sees your friends, Groups, interests. For some sections, visibility may be controlled by another app, or you may just have to select to hide that section. In most cases you will want to hide your friends from public inspection, but also, depending on your interests, your music or membership of Groups. Note that there is no option to make private the information that Facebook deems as your ‘public’ information. This includes your name, profile picture, cover photo, gender, username, user ID (account number), and networks. Note note: even when you update your profile and cover photos, the old photos are still visible to the public in the Profile Photos and Cover Pictures folders in your ‘Photos’ section. These folders are always public. To remove these photos from public view, remove them from the Profile Photos and Cover Pictures folders. Sometimes you get friend requests from colleagues, potential clients or fellow group members – people you don’t really want to let into the inner circle, but you still want to be friends. Facebook allows you to restrict the access by adding them to a restricted list whereby they only see information that you make public, but they are still friends. Go to your Friends tab and then find the friend in question. You can then classify them as Close Friends, acquaintances or add them to the Restricted list, which you find under ‘Add to another list’. Facebook also provides more lists depending on your interests, and you can add custom lists using the ‘+New List’ option. In this way you can target your Facebook updates to an appropriate audience. There’s no need for your mother to see everything! And that’s it. By following these simple steps you can use your Facebook profile, in public, with confidence!